Resource for cigar smoking, culture, lighter, lighting, humidor, ashbin, cutter, julieta. Welcome to ashbin.com. A site dedicated to the resurging cigar culture, and more specifically, the appreciation of the “Churchill”. The aim of this site is to inform our readers with some interesting facts on the history of cigars, as well as to give them some step by step instructions on how to truly enjoy their cigar smoking experience. 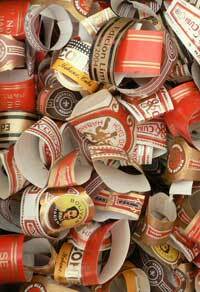 Since the nineteen nineties, the cigar has seen a revival in its popularity throughout western culture. Once again people are enjoying the sophisticated pastime of smoking handmade, quality cigars. Certainly the resurgence can be partly linked to our modern obsession of the celebrity culture. Pop culture icons such as Jack Nicholson and Arnold Schwarzenegger’s enthusiasm for cigars have undeniably aided in this rebirth. The Churchill, also known as the Julieta No.2, is perhaps one of the most popular styles of cigar. Seven inches long with a ring gauge of forty seven, Churchills are considered to be one of the larger handmade cigars available. Nicknamed for the former British Prime Minister, these Julietas are a pleasure to smoke from start to finish. Relax and enjoy this site, much the same way you would enjoy a quality handmade Cuban cigar. Take your time and explore the gallery of Churchills showcased on our “Cigar” page.